ibis Styles Dubai Jumeira is perfect for both corporate and leisure travellers, thanks to its prime location and easy accessibility. Guests staying in its 191 rooms and executive suites will enjoy its modern and chic interiors, plus premium in-room amenities including flat screen TV, personal safe box, minibar, IDD phone and much more. A fully-equipped gym and temperature-controlled indoor swimming pool are available for guests who wish to relax and rejuvenate within the comfort of the hotel. 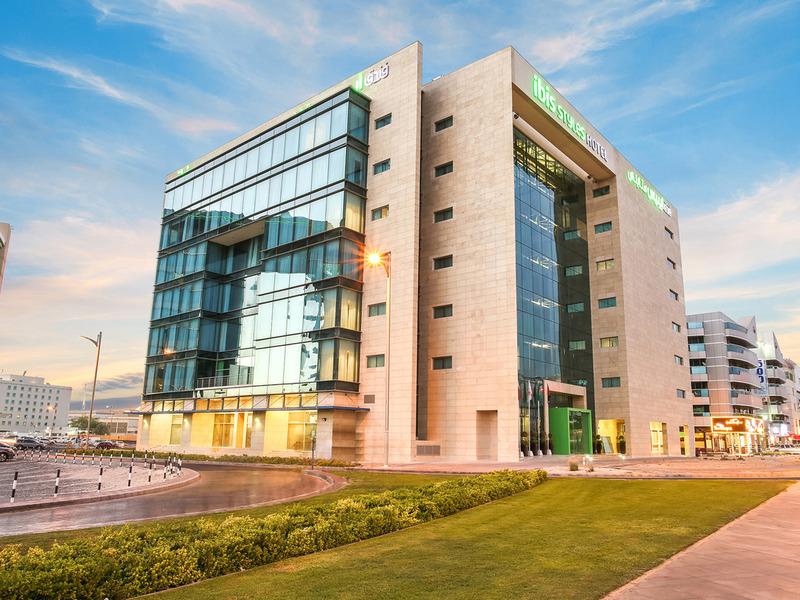 Just 12km from Dubai International Airport, ibis Styles Dubai Jumeira offers convenient access to Dubai's major business hubs & leisure attractions, such as Dubai World Trade Centre, Jumeirah Mosque, Burj Khalifa tower and upcoming Etihad Museum. Numerous shopping opportunities lie within a short drive: traditional Deira Souk, impressive Dubai Mall, Karama Centre for bargain souvenirs and handicrafts, and Egyptian-themed Wafi City's luxury boutiques. Or just lounge on the gorgeous local beaches. Khana Khazana will be your new favorite Indian Restaurant in the area, they serve lavish and delicious Indian Dishes that will surely satisfy your taste buds. Pippin Hot Restaurant serves Italian and Asian cuisine in an A la Carte Service. Street Café is the hotel's all day dining restaurant. It offers a menu full of flavors, fragrant aromas and artistic presentation designed to tickle the café. Daily buffet breakfast is supported by an extensive a la carte menu featuring house specialties. Only 2 devices can be connected to the Wi-Fi And they didn’t realise I’m a silver member so the tone used to asking me to check out in 15 min otherwise extra charges will be levied. An then the rate quoted by them and that on Accor hotels website had a difference of around 500 AED. Customer service was excellent at the front desk, they were very helpful and gave suggestions as we need them. The Breakfast buffet was very good, the people were very attentive to the need of every one that was present. Very clean rooms and overall We were very happy of staying there. Thank you. Nice roome - good size & neat furnishings. My stay was a very comfortable and safe experience. The stay was fine : nice welcome and professional guests ready to help and give advice. Location allowed me to move quickly from one event to the next one a d even come back to the hotel and rest and return to some other event. Food was good at the hotel's buffet and the staff was also nice and professional. Same for room staff who were highly understanding. Next time I hope I can take time to go to the beach. One regret : the room's window cannot be opened to take the sea breeze at night so I had to go out and walk towards the Docks to enjoy it. Best regards. I had to carry my luggage to check in and out, very dirty old towels, dark room lighting is bad, TV channels are limited, food selection very limited and expensive, massage very expensive, bad room cleaning, bed sheets and pillows cover not changed for one week, and the parking was very steep and checking points while going in and out. Efficient service and very helpful staff. We enjoyed the stay and staff at hotel were very helpful in providing assistance and information. Vegetarian options for breakfast can be increased. Assistance or Bell staff to help out, at least for guests with more luggage can be considered. Overall a place definitely to strongly recommend and revisit next time. A huge plus definitely is ideal location for business and visit needs of everyone. Great location in bur dubai. 15min pleasant walk to metro or a few minutes taxi ride. Plenty of eateries within walking distance. Clean and spacious rooms, cleaned daily. Good choice of breakfast and friendly staff definitely would recommend staying here. It's affordable and brilliant. Last year I stayed at a five star hotel, the only difference was the breakfast. Obviously the five star had a very huge selection but ibis styles was just as pleasing. Comfort and service at ibis was 5 star. Will surely be staying here again. I was there once when it's opened at 1floor with balcony, it is very nice room and facility. This time walk in and check in at early morning 3am, reception is very friendly and welcome and try to help me, even extra help for a lighter as too late go out find to buy! Even walk in without booking, they did not overcharge me , this is very appreciate, it is becoz my mistake missed to book advance one night from other hotel. Room facility is good but the washroom may need some maintains to keep new. It would be good if can provide slipper. The Ibis styles are the style and services that deserves a 5 star. I definitely enjoyed my stay at the hotel. Especially the reception is extra friendly and very accommodating. The reception is exemplary dealing with clients. This is a pleasant hotel to say at if on holidays. A very large room made staying in the room for dine in or drinks very comfortable. The toilet was strangely far too small! Breakfast was a bit of a disaster as there was only 2 staff and they could not clear the tables so plates and left over food was left lying on tables and even placed on the floor or on the restaurant furniture when guests had to clear the tables themselves. Breakfast time was a ‘shambles’ due to understaffing. Breakfast was the norm for Ibis Styles with made to order on top of the buffett. Paper cups for the coffee was weird and so I asked for crockery and got it delivered to my table every morning. Thank you but crockery should be the norm - even Ibis serve coffee in the morning in crockery. We used one of the in-house restaurants for room service but had to pay cash which was strange. The pool is about 10 metres long and the gym workable. Overall a pleasant stay. Really It was amazing experience . the staff were very friendly, have wonderful smile . I would like to thank specially the reception staff Mr. Imran, Ms. Jessica and Ms. jane. Those people were very nice and cooperative with attractive smile in their faces. Thank you all for great support and assistance you have really great staff. Thank you. This was my second stay at the ibis styles and I absolutely loved it. The rooms are spacious and clean, the staff is very friendly and professional and they go out of their way to make you comfortable. The location is bang on too in Jumeriah and this is now my hotel of choice for all my Business / Leisure trips to Dubai!